The same careful acoustic design and advanced materials used in the ART active speakers have been utilized in the ART500 passive speaker. Combining high efficiency, high power handling and excellent sonic performance, the ART500 provides practical solutions for permanent installation applications. The two-way design consists of a 15" woofer with a 4" extended coil and a massive magnet structure for accurate, powerful bass reproduction. The high-frequency section uses a Polynomial CD horn loaded to a 2" exit titanium compression driver and new technology, ring-mode suppression design, to deliver controlled coverage at the highest sonic purity. The CD horn is a part of the molded enclosure. 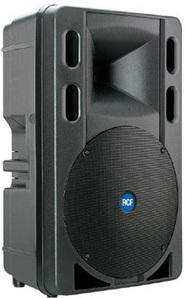 The system includes a high-level crossover network that features oversized inductors in series with the woofer, yielding improved current handling, reduced phase shift and superior transient response. Dynamic high-frequency driver protection is accomplished with a fast-response filament resistor, chosen to compliment the power curve of the driver. All components are housed in a light weight, vented enclosure formed from polypropylene that is extremely rigid and is weather resistant. In addition, the woofer is protected by a metal grille. All controls and connectors are recessed on the rear. A 1-3/8" stand socket and M10 threaded inserts and are molded into the cabinet to provide quick and easy installation using specially designed accessory mounting hardware. This Mackie Industrial product is covered by an exclusive, one-time NO FAULT repair policy in addition to a five year, limited warranty. 1 Measured on axis in the far field with 1 watt (2.83 V RMS, 8Ω ) input and referenced to 1 meter distance using the inverse square law. Listed sound pressure represents an average from 300 Hz to 3 kHz. 2 IEC Spectrum, Peak for 2 hours with +6 dB crest factor. 3 Recommended Amplifier is a power capability value that should be taken as a guide.